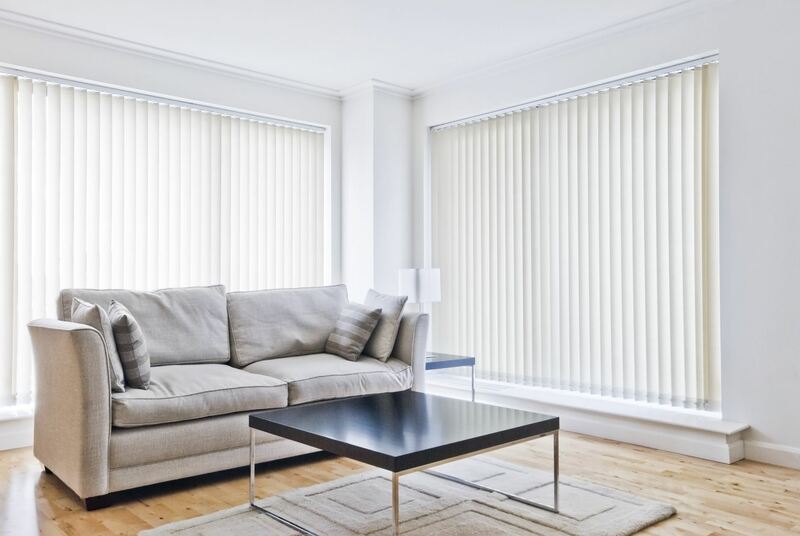 Aside from Curtains, another popular choice of Soft Furnishing that Singaporeans look at to keep their home cool is the proper usage & installation of Blinds. Quality blinds should not be underestimated, as these are much more useful than you would normally assume. The Curtain Boutique is a leading Singapore Curtains & Blinds company, which provides everything from Roman and Venetian styles, to Panel and Motorized ones, at varying prices, so that everyone can have their pick. 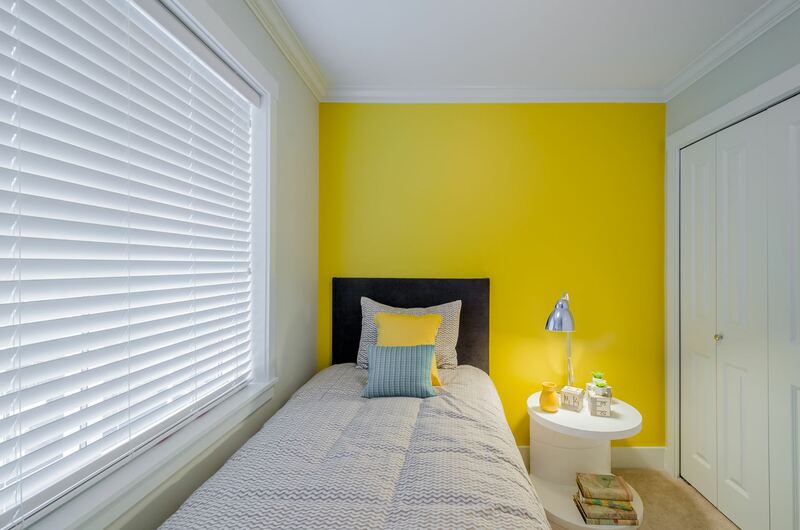 These blinds don’t just provide you with much-needed privacy at your home or office, but also add to the aesthetic of the living environment and protect you from the harmful rays of the sun. If you’re wondering where to choose your blinds from, look no further, for we are equipped with a collection that you will immensely enjoy choosing from. As one of Singapore’s top soft furnishings’ companies, we give you an array of window blind designs to complement the décor of your home or office space. Our blinds come in various materials, fabrics and colors, and are designed to give an attractive appearance to your interiors, while letting the natural light flow in with ease. Roller blinds can help significantly by reducing the sun’s glare yet allowing light to filter through your home. 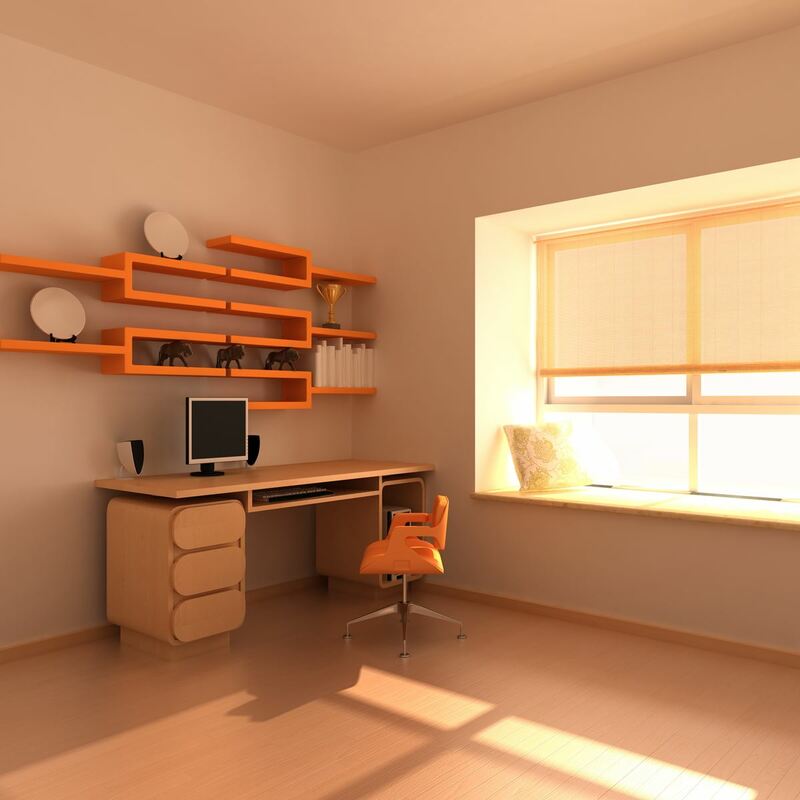 Ultra violet rays (UV rays) cause damage to your furnishings at home. Therefore our roller blinds offer your furniture protection against the harmful rays, and prevent fading and corrosion of your furnishings. Our Roller Blinds come in both indoor and outdoor functions and uses. Click on our Roller Blinds to find out more! Besides roller blinds with the indoor uses and functions, roller blinds also come with an exterior function which is known as outdoor roller shades or exterior shades. Outdoor Roller Shades are installed at your balconies to prevent rain or harsh sunlight from coming in. 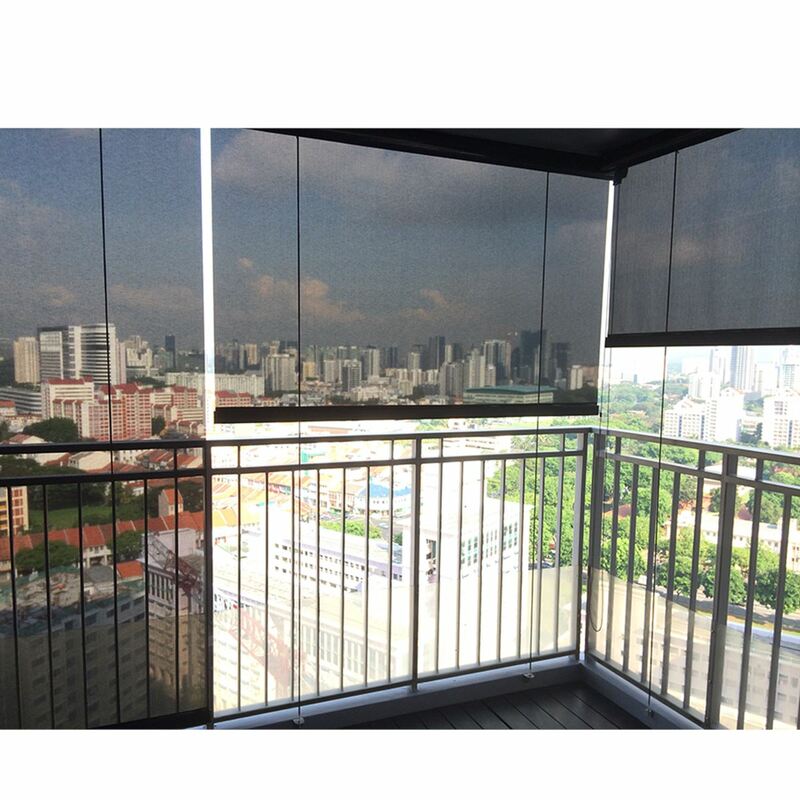 Our outdoor roller shades are easy to maintain with just wiping it off with mild soap and water. Mainly functioned to protect your home and soft furnishings by preventing rain and sunlight entering your home. Click on our outdoor roller shades to find out more. Make a fashion statement at your home with our roman blinds. Roman blinds create a luxurious feel, and a contemporary modern style to the whole look just by being a window dressing. Roman Blinds are designed in a single fabric with neat symmetrical folds, creating a sleek and relax feel to your decor. Click on Roman Blinds to find out more of its elegance design. Venetian blinds come in horizontal slats which are one above another. They are suspended together, by which all slats in unison can be rotated through nearly 180 degrees. The slats can be rotated in such a manner that they overlap with one side facing inward and then in the opposite direction so that they overlap with the other side facing inward. 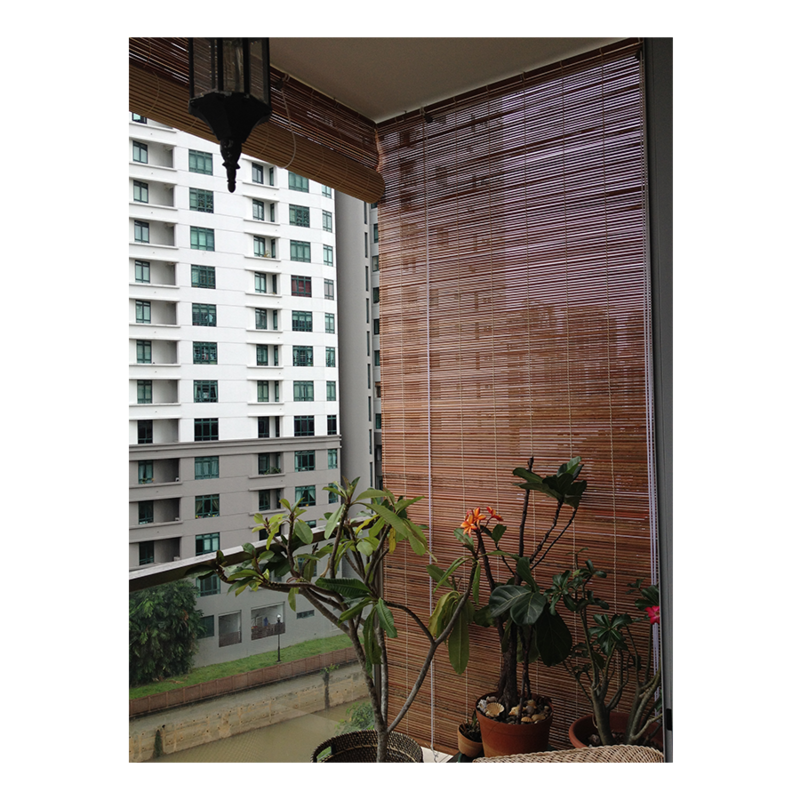 Venetian Blinds comes in 3 types: PVC, Wooden and Aluminum. Click on Venetian Blinds to find out more. A simple, yet practical and cost efficient window covering to dress your window and provide you with privacy and sun protection. Although simple, it provides your decor with the compatibility of both style and function. 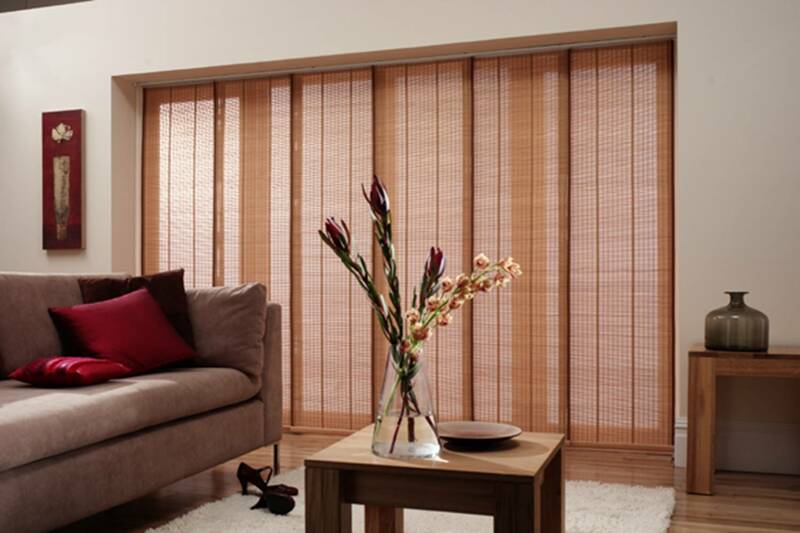 These blinds are ideal to treat large space, and can also act as a room partition. 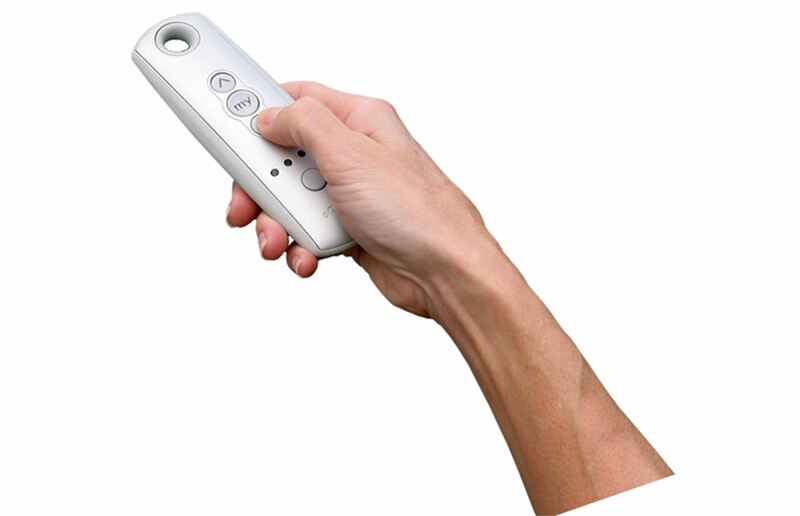 Great for both home and office use. Click on Vertical Blinds to find out more on out. 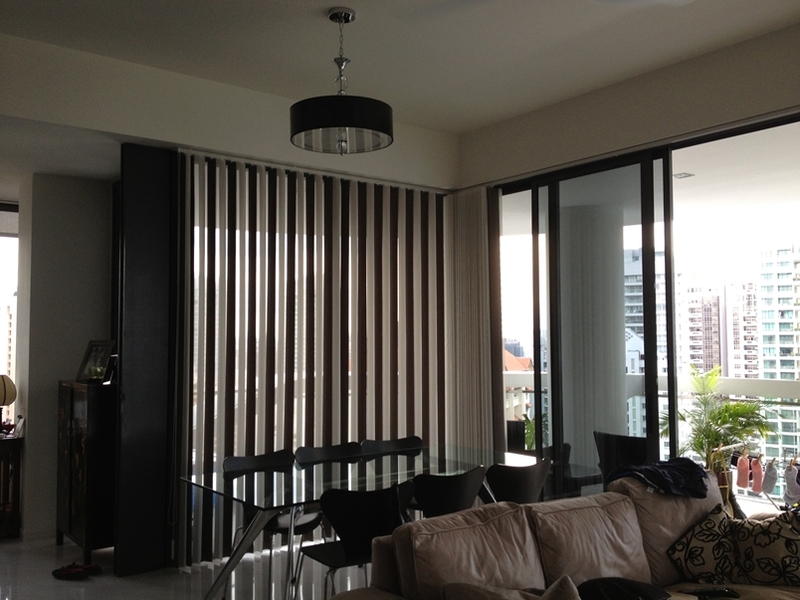 Vertical sheer blinds give you total light control with either sheer or room darkening fabrics. Similar to the standard vertical blinds, Vertical sheer blinds will be a perfect companion for sliding glass doors and large and tall windows where elegance is a must for home or office. Vertical sheer blinds come in different sorts of materials and sizes with different colors. Installation is also easy, along with the ease of operation. You are sure to fall in love with the beauty and elegance of this window blinds. Click on Vertical Sheer to find out more on out. Vertical blinds offer different types of chain system or in a one control system. Vertical Blinds offer adjustment of light filtering system. Vertical Blinds do not only come in a single style, which is commonly seen the straight down style. 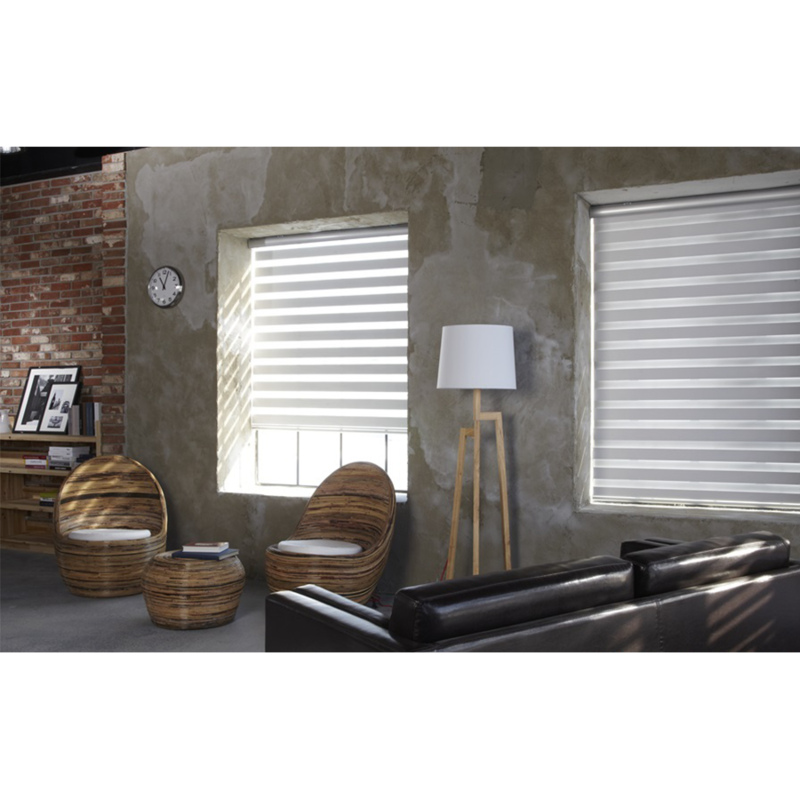 Vertical Blinds also come in S-Curve style which is known as S-Vertis blinds. 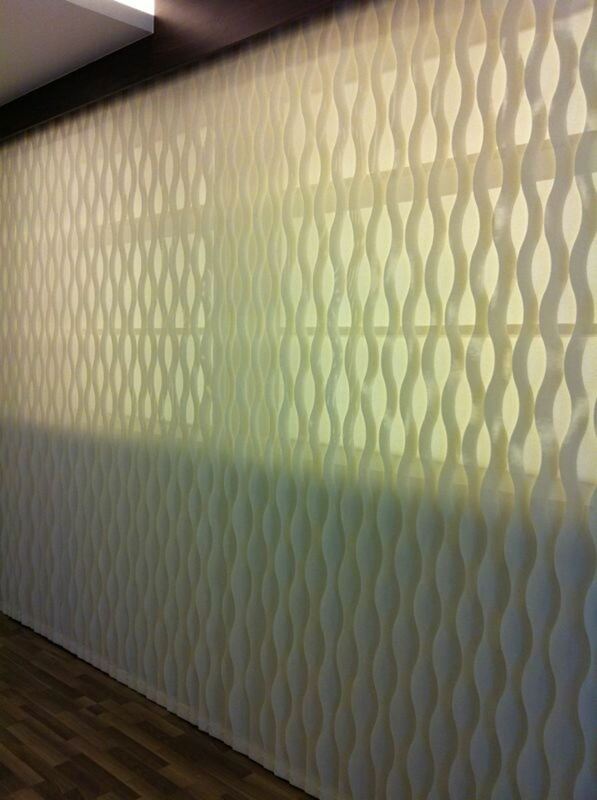 A great alternative to the standard vertical blinds. Click on S-Vertis to find out more. An elegant dim-out fabric which is suspended in between two layers of sheer materials and allow sunlight to shine through the window. Rainbow Blinds are also called shadow Blinds makes your window look unique by combining both horizontal and roller blinds functions into a single blind. Click on Rainbow Blinds to find out more on out. Bamboo blinds gives out a cozy feeling as it may resemble a mini hut, however they are also an unique design collection as these bamboo blinds can also come in wood colour if you like a natural feel, or black and white, and other others if you like customisation. You may see some wooden looking blinds in colours, are actually bamboo blinds, however painted with colours. Click on Bamboo Blinds to find out more on out. Panel track blinds offer a simple and stylish solution for patio doors, sliding glass doors or large windows. They are also known as sliding window panels or panel tracks. Panel blinds cover a large window using fewer panels than the commonly used vertical blinds, and also contributing a clean and uniform appearance. Click on Panel Blinds to find out more on out. Motorized blinds, a simple and efficient function to improve your living.